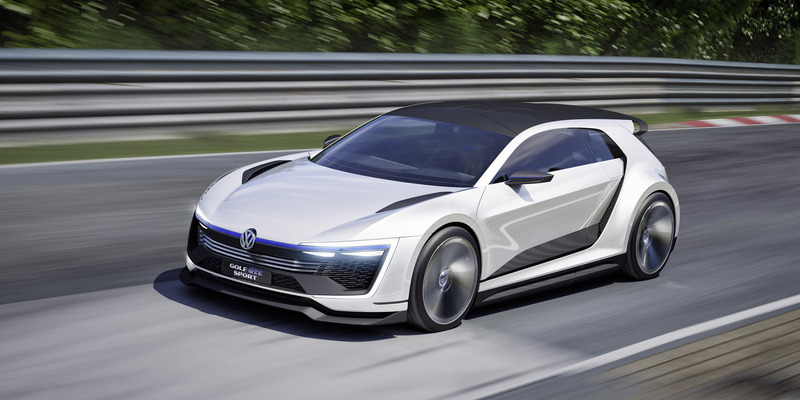 With the Golf GTE Sport presented as a world premiere at the legendary GTI event at Lake Wörthersee on 14 May 2015, Volkswagen is catapulting the GT tradition into the future. 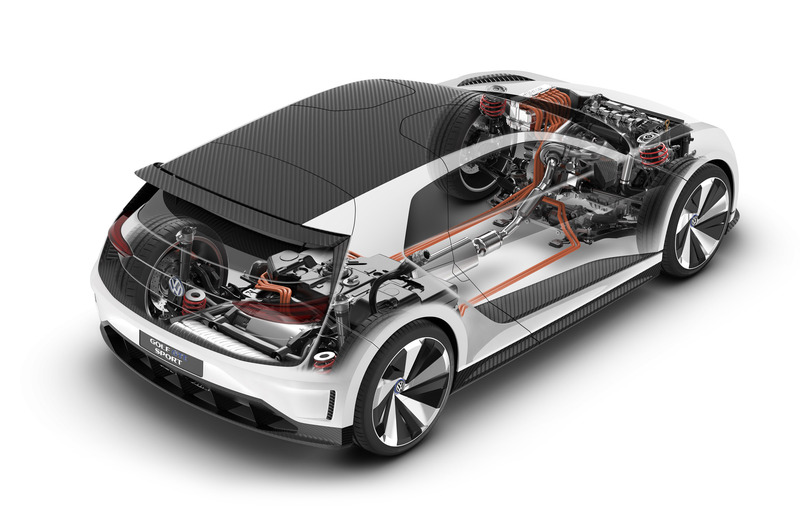 The high-tech Golf that is largely made of carbon is powered by a total of three motors – combined in a plug-in hybrid drive with system power of 295 kW / 400 PS. The concept car breaks down traditional barriers between road and motorsport vehicles. Its progressive hybrid system in combination with the high-tech all-wheel drive, a lightweight body, optimum aerodynamic downforce, precision running gear based on the design of the current Golf GTE, a new motor racing cockpit (including visualisation of the racing line) and an unusual seating concept (two monocoque-like interior areas) enable breathtaking performance on the racetrack. At the press of a button, however, the concept car is able to cover a distance of up to 50 kilometres on electric power alone and hence with zero emissions. 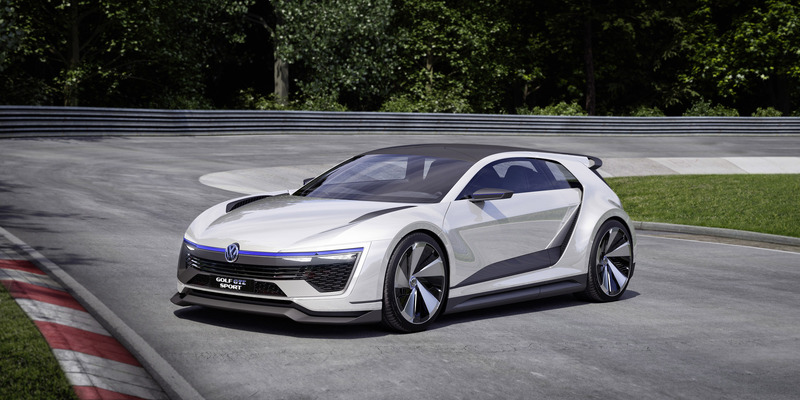 The concept of the Golf GTE Sport has been designed so that the car is at home in both normal road traffic and racetrack conditions. Accordingly, the drive, suspension, body and interior all follow the principle of a pure-bred sports car. The drive system offers maximum agility, the suspension displays maximum neutrality in interaction with the all-wheel drive, the carbon body is lightweight and with its balanced aerodynamics it virtually adheres to the road. The driver ergonomics bridge the gap to motor racing, and with optimum weight distribution and a low centre of gravity the overall package ensures that a lap around racetracks such as the north loop of the Nürburgring is a unique driving experience. The driver and passenger board the two-seater interior of the Golf GTE Sport through doors that swing right up in the style of the XL 1. The doors extend a long way up into the roof and down into the side sills, resulting in convenient boarding when they are opened upwards. The interior in carbon and microfiber consists of two completely separate areas for the driver and passenger. Like in motorsport vehicles, they sit quite a long way to the back on racing bucket seats with five-point belts. Accordingly, the steering column that is entirely clad in carbon projects a long way into the interior where it appears to float – a further characteristic feature of a rally car or touring-car racer. 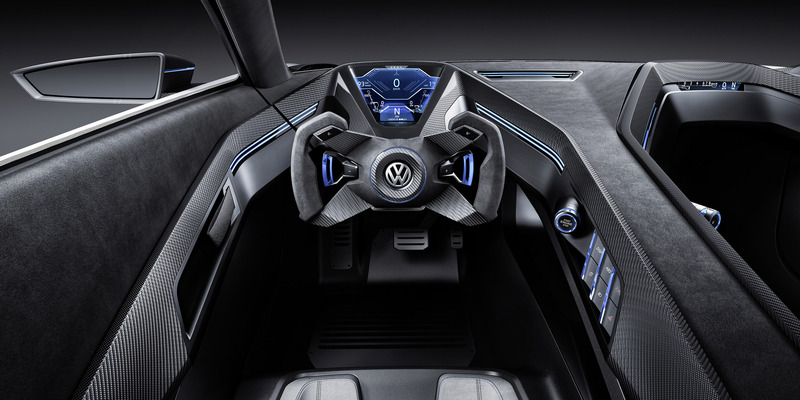 The functional elements are operated via controllers and buttons in the cocoon-like interior trim. The gearbox of the Golf GTE Sport can also be operated manually with shift paddles on the motorsport steering wheel. The body of the Golf GTE Sport is largely made of lightweight carbon. 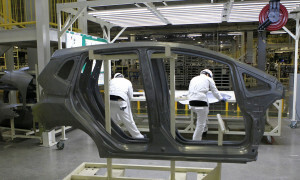 As both a brand and a group, Volkswagen is a trailblazer in the industrial use of this material. For example, like the exterior of the Bugatti Veyron 16.4, the body of the Volkswagen XL1 is also made of carbon. The high-strength carbon body of the Golf GTE Sport therefore weighs much less than a comparable steel body. 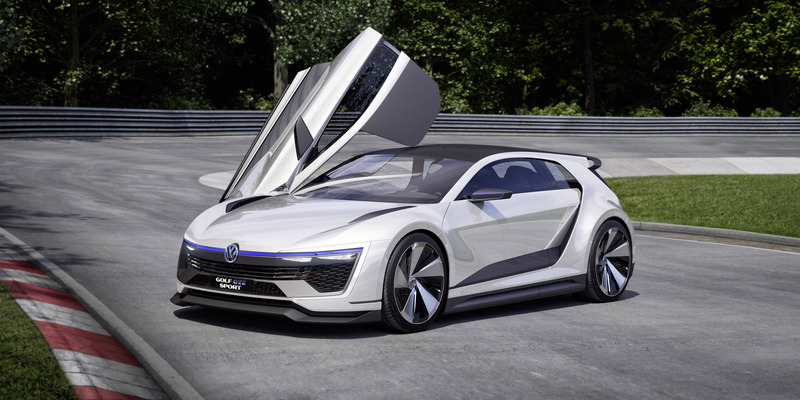 The design concept of the Golf GTE Sport manifests itself in the car's striking silhouette. 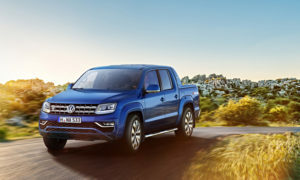 Here, Volkswagen is continuing the idea of C-pillars with a two-level design originating from the 2007 Golf GTI W12-650, which has been constantly further perfected in various concept cars. 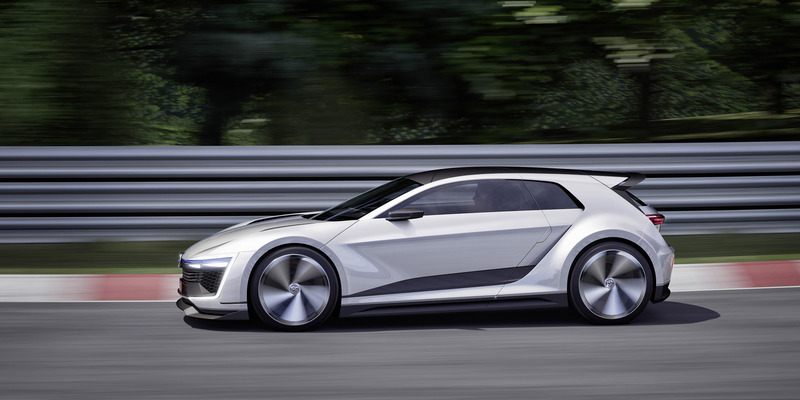 On the Golf GTE Sport that is now being presented, this C-pillar concept, which is unique worldwide, has reached a degree of perfection that allows it to leave the show car stage and – as a design vision – bridge the gap to the Golf GT models of the future. The basic styling of these pillars (like the string of a bow taut with an arrow) follows the unmistakable Golf design, but at the same time feature some completely new C-pillar details: behind the level visible from outside a second one opens up. The airstream flows between these two levels and is contributing to the aerodynamic downforce and to the cooling of the rear brake system. Stylistically, this concept means that the rear section (like the front section) is extremely wide. By contrast, the passenger cell between the A-pillar and the interior part of the C-pillar becomes narrower when viewed from the front to the rear – an avant-garde interplay of extremely powerful shapes. The switch on board theGolf GTE Sport that is most important for dynamic performance is located in the overhead console. It bears the letters “GTE”. When the driver operates this switch, the character of the Golf GTE Sport's drivetrain changes drastically in an instant because now the full system power of 400 PS is available. 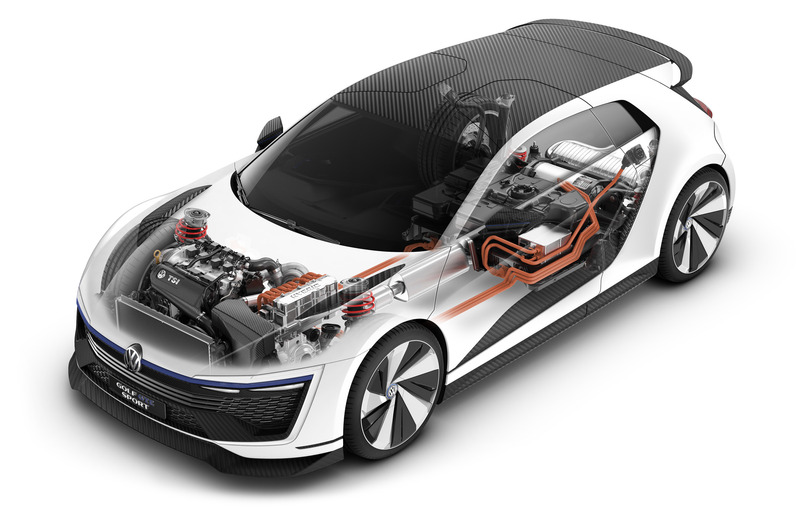 The turbocharged 299 PS petrol engine alone delivers immense propulsive power, and at this high level the electric drive components of the Golf GTE Sport assume an additional boost function. The boost effect is so strong that the drive unit would also perform well if used in professional touring car races: the Golf GTE Sport sprints to 50 km/h in 1.8 seconds, reaches 100 km/h in 4.3 seconds, and the maximum speed permitted in Austria, i.e. 130 km/h, in 6.5 seconds. On German motorways, the concept car reaches 200 km/h in 15.9 seconds. In “GTE-Mode” all four wheels of the Golf are driven.